Can you describe a duck? Can you describe a cat? Now, can you tell someone who has never seen either, how they can tell the difference when they are placed side by side? Can you describe a dog? Social Media and Social Networking can easily be popped into this thinking exercise. 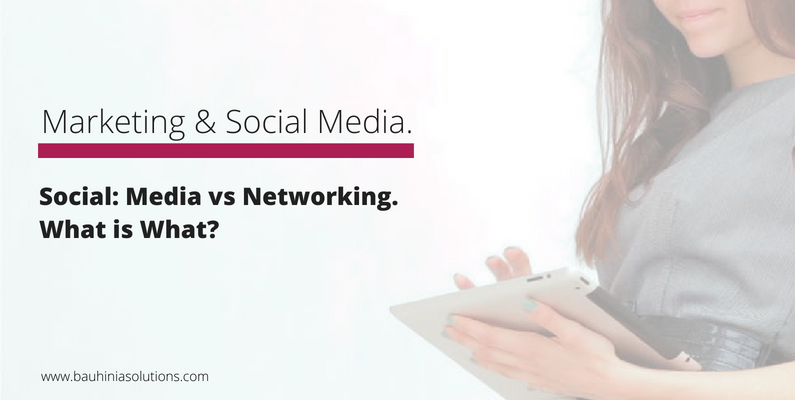 It is quite easy to tell you what social media is and how it differs from traditional media, just as it is easy to tell you what social networking is and how it differs from traditional networking, but contrast the two and then tell the difference – not so easy now, is it? Both are online. Both involve friending/connecting, liking, sharing, posting, profiles… the list of similarities can go on and on. But where they differ and where the grey area ends and distinct lines are drawn varies. I have read a great number of articles and this is what I conclude: It is about intent. Your goal. What are you trying to get from the platform and in what capacity are you using it? I truly believe that a single platform can be Social Media for one person or business and Social Networking for another. the intent of Social Networking is One-to-One. Sure, some platforms are purely Social Media; YouTube and Vimeo for example, where the video qualifies it as media and the functionalities to comment, share, and like, qualify it as social. But it stands alone, no matter who publishes the content, the video is there. Pure. Social. Media. A chat room, on the other hand, would be strictly social networking (admittedly and generally speaking not quality or safe networking, but pure networking nonetheless) where people speak to one another and engage in conversation. But hybrid products such as Facebook, Twitter, LinkedIn, Google+ and the like allow you to make them what you will – they bend and mold themselves to your intent. Example A: Ashton Kutcher, the most famous Twitterer of all time. His Twitter account is Social Media – a way to promote and bolster fame by making him socially accessible. Giving him a public voice. Twitter is his microphone. He is speaking at you, not actually to you. Like a presenter or a politician. He is not engaging with all 16.6 million followers. He does not want to. He couldn’t. Is he connecting with Hollywood directors, relying on his twitter connection to score an audition? Using twitter to collaborate with other artists on new projects? Nope. Do you see the difference? It doesn’t mean that you have to make a solid decision and only use networks in a single way. The platforms are hybrids and your strategy can be too. What is important is that you can understand and define the nuances of your social activities so that you can reconcile them against the performance indicators of your strategy/campaign – and get the most out of your efforts! Example C: A restaurant creates a Facebook page. They utilize the page to promote a seasonal menu, daily specials and events, contests and updates, (Media) etc. But, the manager of the restaurant also takes a moment each day to communicate directly with 2 patrons, from wishing them a happy birthday, responding to a complaint in the public forum, or open conversations about ideas for new menu items (Networking). A hybrid plan. If you want a hand creating the right strategy for you or your business, call us today and set up a Strategy Session.